Tutankhamon is a feminized Marijuana strain from Pyramid Seeds. Is a strain with one of the highest level of THC that exists on the market. 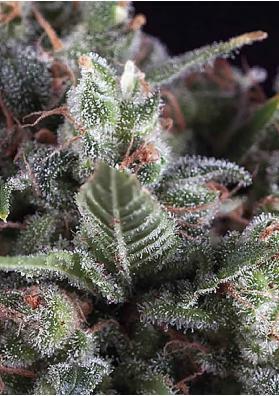 Psychoactive high and marked Skunk flavor, capable of producing huge amounts of compact buds. Tutankhamon is a feminized sativa dominant (60%) Marijuana strain created from a vigorous selection of AK-47 being the strain with the highest levels of THC (33%) that exists on the market as analyzed by Energy Control at the 2011 Spannabis in the Barcelona. It's marked aromas and flavors of fresh fruit, skunk and citrus combine with one of the most intense cerebral experience to deliver a truly satisfying smoke and a long-lasting psychoactive sativa effect. The plant is quite small (80-110) with a compact and multi-branched growth struture that facilitate the abundant production of buds. This makes it ideal for selection of a mother plant. The large amounts of buds that are produced have a delicious aroma and a fresh fruity flavor besides containing an average level of THC of 33%. Considering the quantity of its buds, we recommend to pay attention with fungi and mold and to not cultivate the plant in too humid environments. Indoors and after 60 days the plant can reach heights ranging from 75-150cm capable of yielding 600g per square meter. Nonetheless, is on outdoors where this specimen gives the best of itself being able to offer you between half a kilo and a kilo and a half of amazing Marijuana to be collected in September. In this environment the plant will reach between 1 and 2 meters high. How do you stay?